In all seriousness it has been like 100 degrees in Atlanta for the last week straight, and I swear I am not exaggerating. I wanted to make dinner Friday night and not turn the oven on, but still have a delicious meal including a veggie, meat and carb. 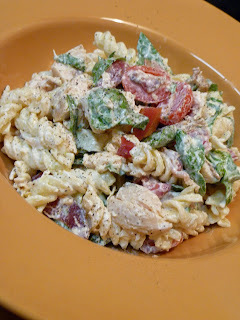 I came up with a Chicken BLT Pasta Salad that was a huge hit; I am not sure who enjoyed it more, me or the boyfriend. I bought a rotisserie chicken from the deli and the precooked bacon that you crisp in the microwave, to minimize the amount of time the stove was on. However, these two ingredients could be cooked at home or you could just use leftovers from something else; either way this salad will be delicious. 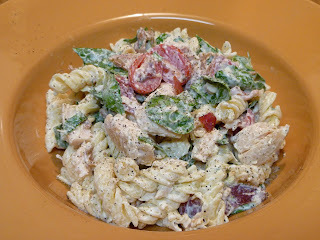 Considering this meal came together for less than $10, the only cooking was boiling pasta and the flavor was awesome; it will become a regular in my dining rotation! Bring a large pot of water to a boil, salt well and add pasta; cook according to package directions to a little over al dente. In the mean time make the dressing: mix mayo, sour cream and ranch packet in a small bowl. Once pasta is cooked, drain and rinse with cool water, then place in a large bowl and add half of the dressing, mix well, cover and refrigerate for at least 30 minutes. This allows the dressing to really stick to the pasta. While pasta is chilling, prepare all the other ingredients: chop chicken, spinach, tomatoes and bacon, add them and the remaining dressing to the pasta, stir well and top with fresh ground black pepper. 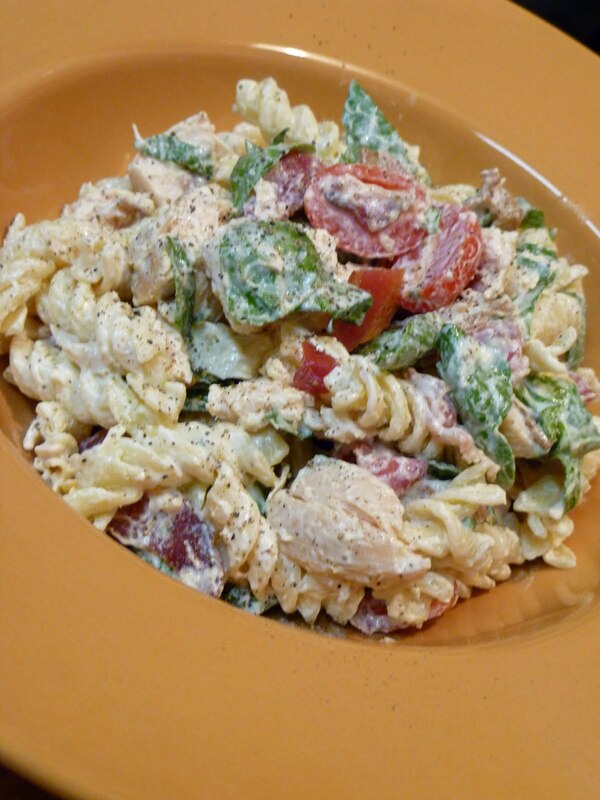 This salad can be made ahead of time, even up to a few days so long as it is stored in the fridge.